BLAST off to the FUN book launch: Jo-Kin vs Lord Terra (Super Space Kids 2). Children’s author Karen Tyrrell pilots her second FUN and thrilling space adventure with STEM science. 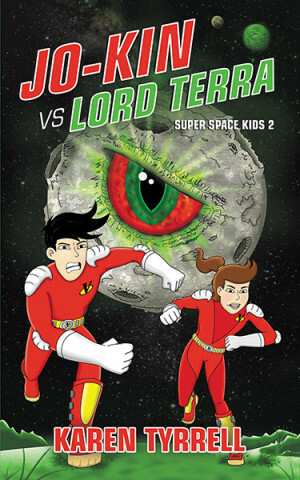 Jo-Kin vs Lord Terra is the exciting sequel to Jo-Kin Battles the It (Super Space Kids 1). Jo-Kin is aligned with Kids Matter and STEM science in the Australian curriculum. Karen will present an interactive story telling session with SURPRISES, interviews, hilarious skits and book readings plus FREE prizes, surprises and out-of-this-world FUN. Karen Tyrrell is an award winning author and teacher of five children’s resilience books. Jo-Kin Battles the It, STOP the Bully, Bailey Beats the Blah, Harry Helps Grandpa Remember. Karen’s books empower kids to live strong. Karen presents pantomimes, story-telling, writing workshops, author talks in schools, libraries and festivals. What’s on the FUN Book Launch program? Trevor Salter, illustrator makes a guest appearance sharing his secrets on illustrating the cover. He’ll show super hero Jo-Kin, his girl side-kick Captain Astra and the evil alien Lord Terra. Plus he’ll reveal sneak peeks of exciting illustrations INSIDE the pages of Jo-Kin vs Lord Terra. Will there be robots, aliens, gadgets and incredible machines? FUN Book launch Prizes Galore! Come dressed as your favourite spaceman, super hero, robot or alien. Start digging through your dress-up box for a cape & mask, a helmet & boots OR a pair of antennas. Over ten prizes to be WON! Zoom over for FREE Crafty, science and writing activities for kids to enjoy. Karen will personally sign your own copy of Jo-Kin vs Lord Terra. Help launch Jo-Kin vs Lord Terra into the cosmos! Are you joining me for intergalactic FUN? Beau loves going to your book launches. He discusses them every chance he gets (usually when buying books, to the seller). We went through his dress-ups this afternoon in anticipation of the Big Day. As you know Beau was meant to be with his father that weekend which makes the opportunity even more special. Fortunately his Dad agreed to swap weekends. You really touched my heart with Beau’s words and enthusiasm. I’m going to make it the best launch yet. Can’t wait to see you both there.